Since I’m headed to Wisconsin this weekend to visit my grandparents, I thought I’d throw in a race. I’ve been interested in Timo Yanacheck’s Mad City races for awhile because there aren’t many road ultras to choose from. I’ll run the 100k and Greg will run the 50k. Crazy, he never chooses the shorter distance! I got to wondering if anyone has won the National Championships in both the 100k trail and 100k road races in the same year. According to the USATF website, the 100k Trail NC has only been held since 2008. But also the most recent result on there is from 2011, so who knows how accurate that is. The 100k Road NC results go back to 1987. It looks like Mad City has served as the Championship race since 2007. From what I can tell, no one has won both even in different years. Check for yourself here. I surprised myself with 2nd place in 2:56 down in Woodlands, TX. Every time I tried doing a marathon-specific workout, I either bailed or failed miserably. Thinking it was important to get some flat, fast miles in, I’d try to run marathon pace on the bike path. I could barely do one mile at 6:50 pace, so I figured I was doomed. It was my goal to run under 3 hours to get in the A wave for Comrades. Here is the qualifying times for Comrades’ waves. My previous qualifier was the hilly, rooty Squamish 50, putting my behind thousands of starters in the F wave. Adding to the pressure, I saw my write-up in the Race Guide. So instead of running my 6:50 miles, I hiked up mountains, shuffled on snowshoes and danced in jazzercise. When I finally accepted that I was going to race, I figured I needed some fast-looking clothes. The ride from Greg’s cousin’s house to the race location included two false starts and being pulled over by the police. But we made it! At the race, I kissed Greg goodbye and slipped into my corral with the elites. I felt as out of place as I could be. I was the only one with a water bottle. This is my favorite way to fashion a handheld. 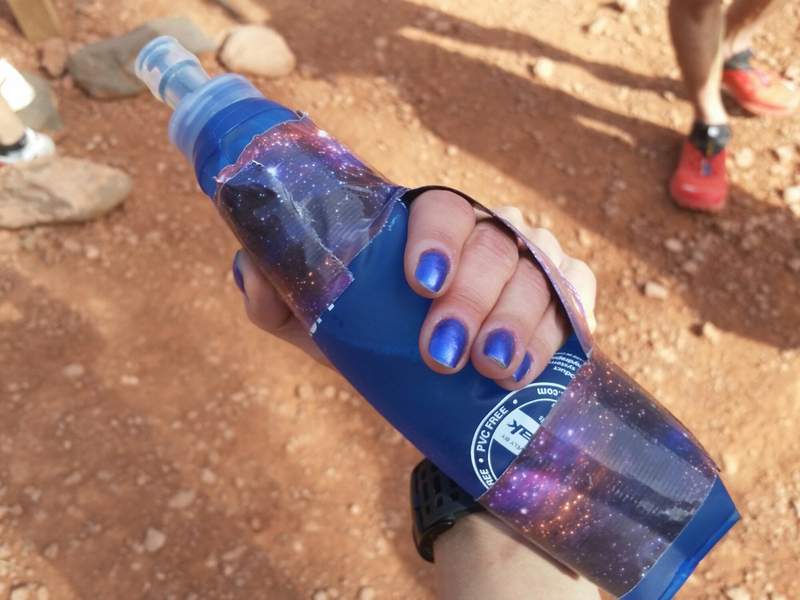 It collapses down to fit in my pocket between aid stations, and with all the fancy duct tapes available, you can make it to match any nail color! When the gun finally went off, I felt so much relief. I looked around and saw the fog lifting, a colorful sunrise, a silly drone overhead and lots of people out cheering. It was actually fun! I was expecting the good times to end when I’d hit the wall and start suffering, but it never happened! I was enjoying the speed and ticking off miles. Somewhere around mile 16 a female competitor came up alongside me and then over the next few miles pulled away. I had a bit of a side ache from a single gulp of Gatorade, so I just relaxed and I figured I’d just see her later. Sure enough, I did! With a couple miles to go, she popped out of the bushes and was running alongside me again. Once more she pulled away, but I just thought “no worries, I’m still feeling alright and I’ll have a finishing kick.” When I passed the 26 mile mark, I turned it on and zoomed into the finish. The whole race seemed so short! What had I been so scared about? To make the whole experience even better, our whole group had good races! Greg’s Aunt Karen did the 5k, his cousin Erica ran the half along with Jeff, who managed to run it on just a couple hours sleep. Greg set a massive PR and was hot on my tail. We even won matching backpacks! Here’s my results on https://www.strava.com/activities/512015438/embed/eb20564b75e5723669ae68645502a669eadceb60” target=”_blank”>Strava. Last weekend I escaped the snowy, icy trails of Boulder to run through the prickly sotol cactus in Bandera, TX. The idea came to me the week before when I was in Phoenix watching Greg crank out 404 miles at Across the Years. It was so nice to run there without skidding, slipping and freezing! Plus I was super inspired by what Greg accomplished and wanted to prove that I’m a little tough myself. I ran Bandera back in 2012 as my first 100k and remember being very intimidated by the distance and competition. However, I had some generous, experienced runners helping me and with ice down my bra and brand new Drymax socks on my feet, I won that year. I missed the course record by about 5 minutes, so it’s been on my mind to give this race another try. I should also mention that running Bandera was a way to get out of having to do another workout with Ryan Smith for a little while. I told him I want to run a sub-3 hour marathon this spring, so he convinced me I needed to practice running fast. My form was bad, my breathing was off and my spirit was crushed. He mercifully let me cut short the attempt to run just 3-4 miles at 6:50 pace. I hope I earned at least a week to recover by winning the National Championship 100k. I arrived late Friday evening to the warm welcome of Meredith and Paul Terranova and their friend, Troy. Not having planned much, it was very nice to be taken in by these planners. It was already light at the 7:30 start of the race and I was surprised to see Michele Yates at the line. We had exchanged messages earlier in the week and I knew she was toying with the idea of driving down, but I thought I was the only goof who’d jump in so last minute. Luckily, she also brought Karen Kantor, who helped me refill my flasks with Tailwind at every aid station. Double luckily, Michele pushed the pace harder than I would have on my own, aiding in a fast finish time despite a major positive split on my part. The course is a 50k loop that we run twice. My first half split would have earned me the CR in the Bandera 50k if I would have “claim-jumped” (not run the distance I signed up for), as Joe Prusaitis says). I was on the lookout but didn’t see Liza Howard until the race had started. I admire her and didn’t want to miss out on some happy conversation, so the first few miles flew by as we chatted. I had a mantra I repeated to myself throughout the race: Maintain all-day pace. When I felt myself taking the downhills too hard, it would remind me to save my quads. When I was tired and practically walking I’d say it again to remind myself that I had saved my legs so I could run at that point! Per USATF rules, we weren’t allowed to wear headphones. I could only remember a few lines of any song, so having a mantra definitely helped. So eventually the race ended and I thought, “That’s the farthest I ever want to run.” I’ll be passing on the Golden Ticket yet again this year and focusing on Comrades in the spring. It might take my skin that long to recover from the million little slices I got from the sotol. I ran this race last year with my leg still kinda broken, so I was eager to go back to a race put on by one of the coolest race directors known to man to try to do a little better. Though my memory of the course from last year is pretty foggy, I do recall slogging up the biggest climb so ridiculously slowly last year, that I was still having nightmares about it. Automatically this year would be better since my favorite person in the world was coming along, Greg. Last year while I was suffering here in Squamish, he was also in Canada, running 100 mile race #8/12 for the year at Fat Dog. It’s worth mentioning that Greg wasn’t coming this year to support or race me, oh no!, but his huge man-crush on Gary Robbins, RD, drew him to the race. So here I am back again and just totally relaxed. I wish I could feel like this at all races. I had taken the summer off racing after some disappointing results in the spring, and I was really jazzed to be back at it after pacing at both Western States and Hardrock. I learned through pre-race interviews and predictions that Catrin Jones and Amanda Basham were going to be tough competition. Catrin had beat me at Chuckanut. Amanda is eight years younger than me. They both turned out to be sweet as can be and I was happy to be running with them for the first half of the race. I have had a few good results by holding back early and being patient, so I applied that again here. The first 10k is flat, so I just took advantage of that time to chat with Catrin and Amanda and enjoy the sunrise. The rest of the race until the final mile was on bike trails with so many roots and steep climbs that I thought several times how impossible it would be to bike that trail. I only saw one biker out there and he was going the other way, so I never saw how people navigate that crap on a bike. But it made for interesting running! I love bike trails for their banked turns, freaky bridges and always runable switchbacks. It feels more like a playground when on bike courses! My uncle Curley introduced me to them in Hood River, OR at Family Man. I owe him for that. The race was a success and the perfect lead-up for Run Rabbit (though I still really think 50 miles is plenty–why 100?? ), Les Templiers and TNF San Francisco. I’m excited for the adventures ahead! Ready, aim, fire! Pre-race competition. Don’t step off trail! Blackberry bushes were thick. After winning beautiful Lake Sonoma 50M in 2013, I was back for round two. Emily Harrison had taken the course record down in 2014, so I was looking to get it back. Steph Howe Voilett snagged the win instead (and got the race director’s puppy named after her), but I was happy to hit my goal of going under the previous CR. gotta keep the gas on the whole race! 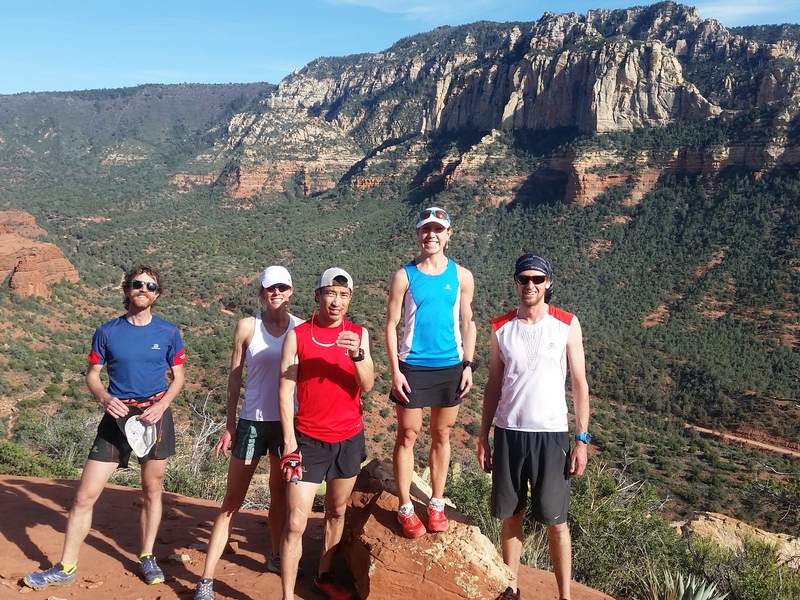 After the Summit in Sedona, Eric Bohn organized a little outing in the Grand Canyon. Teammates JP and Allan came along for this beautiful tour on the Tonto Trail! Most people in the area seemed to visit Sedona to take in some vortex energy with their sparkly crystals, but we went to do some team bonding, explore beautiful scenery, and talk a little shop. It was great to have everyone together to hear inspirational stories about running and other adventures. I’m so thankful to be part of this team!